Aavakai Uragaya is no doubt the pride of Andhra. 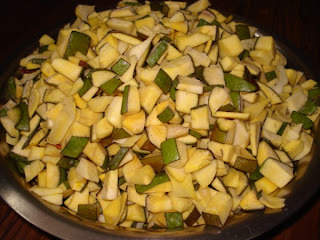 Andhra is known for its pickles and chutneys and every summar is spent preparing this. I have always seen this preparation happening at home with Amma getting the chilli powder from Andhra. 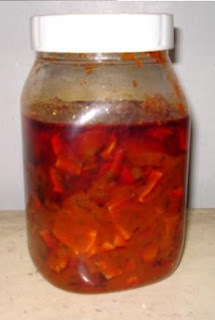 My aunty who used to stay in Vijayawada used to get the special Red chilli powder and prepare this. The spicy and effect comes from adding this red chilli powder. I am giving a basic recipe with small quantity. The proportion is as given by Amma. Once everything is mixed, store it and ensure to stir it in frequent intervals. Can add more Oil depending on the way it sets. Clean and cut raw mangoes in this size. Let it dry for sometime. Powder the mustard powder. Spread half of it in the bottom. Cover it with mangoes, then add red chilli powder turmeric pw and salt with oil. And top it again with the same mixture. Mix well. This is the bottle we prepared for this season. We are still stirring and enjoying it. This is my entry to Sunita's Event on Think Spice ..Think Mustard.